We all know Deliveroo for delivering our favourite eats right to our doorstep, but they’ve since pushed the envelope to go from online to offline. Within the last two years, the food delivery giant has launched two physical dining spaces in Singapore known as ‘Deliveroo Editions’, which double up as their delivery-only super kitchens. Following the success of these two sites, Deliveroo has recently launched their biggest and most advanced Editions site in Singapore to date. Called the deliveroo food market, this new space is just a stone’s throw away from the new Mediacorp headquarters, sitting on the first floor of ALICE @ MEDIAPOLIS. Its eye-catching teal interior makes the place hard to miss! This new site is a significant ‘upgrade’ from their previous Editions sites, with the addition of a tech-enabled dining space that can accommodate up to 40 people. Deliveroo food market houses 7 restaurants and a total of 11 food concepts, which has been carefully curated based on user demand. Some noteworthy restaurant partners include popular favourites like Korean fried chicken brand Bonchon, Vietnamese noodle bar NamNam, NamNam’s sister brand COMNAM, Omakase Burger, and Rasa Rasa. You can also order from some of the virtual brands that are exclusive to Deliveroo such as EZO Hokkaido Eats by Omakase Burger, which serves quality Japanese dons (like their Signature Butadon). For those who are health-conscious, there are plenty of wholesome options as well. VIOS by Blu Kouzina for one, offers bowls that are carefully packed for a balanced diet without compromising on taste. You can even pick your favourites with their Build Your Own Bowl option! Its sister brand, Lucky Souvlaki by Blu Kouzina, specialises in traditional Greek street food that is made with quality ingredients like organic meat. On the other hand, Chop Shop by Pot Luck Club offers delicious grain bowl options like the Thai BBQ Chicken, and you can also get gourmet salads and sandwiches from Delismith by Pot Luck Club. What’s unique about this food market is its fully-automated ordering system. 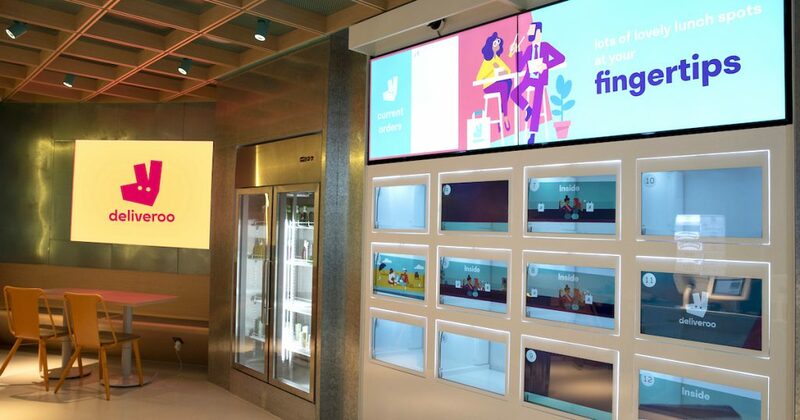 Designed to offer customers “a taste of dining in the future”, the entire ordering experience is automated and powered by eatsa, a San Francisco-based technology automation company. The ordering process is seamless and very user-friendly. If you’re familiar with ordering food through Deliveroo’s app, this shouldn’t be a problem for you. In any case, there are instructions on the screen to guide you along through the whole ordering process. If you do encounter any issues, there are service staff around as well. Instead of ordering over the counter or at tables like most dining establishments, you get to browse the menu and place your order at any of the five self-serve kiosks onsite. Once you’ve settled on your order, checking out is just as easy! You simply need to tap or swipe your card for payment. Order and pay cashless at these kiosks. After placing your order, your name will appear on the digital status board. Once your food is ready, the number of an assigned digital cubby will appear alongside your name. You can then head over to the designated cubby for food collection. Your name will also appear on the door of the cubby, which is a pretty nice touch as it makes the dining (or ordering) experience more personalised. For those who prefer takeouts, there is a takeaway option as well, which you can select when you place your order at the kiosks. Lunch can be a stressful experience for the working crowd, but the entire order-and-collect system makes it so much easier. It is perfect for those who want to avoid unnecessary fuss during their precious lunch break — simply tap to order, pay, and collect your meal. The deliveroo food market is also a good alternative for group dining as the many restaurants housed under one roof offer a plethora of options for all. Unlike a food court, the laid-back ambience there makes you feel like you’re dining at a cafe instead. Moreover, the space offers power points and wifi access, which makes it a great place for working professionals to dine and chill at. For those who need their caffeine fix, the food market also houses Nineteen95 Espresso Bar—this is the first fixed location for the mobile coffee cart brand. Besides that, you can also get Magnum ice cream bars and pints of Ben & Jerry’s ice cream there. The deliveroo food market is only open for dining during lunch from 11am to 2.30pm, and for dinner from 4.30pm to 9.30pm. Beyond these hours, you can still order from the restaurants via delivery until 10pm!